The Brian Ború is a 65 foot (20 Meter), wooden hulled and traditionally rigged Gaff Ketch. There is no other similar vessel in Ireland that is available to book and sail. 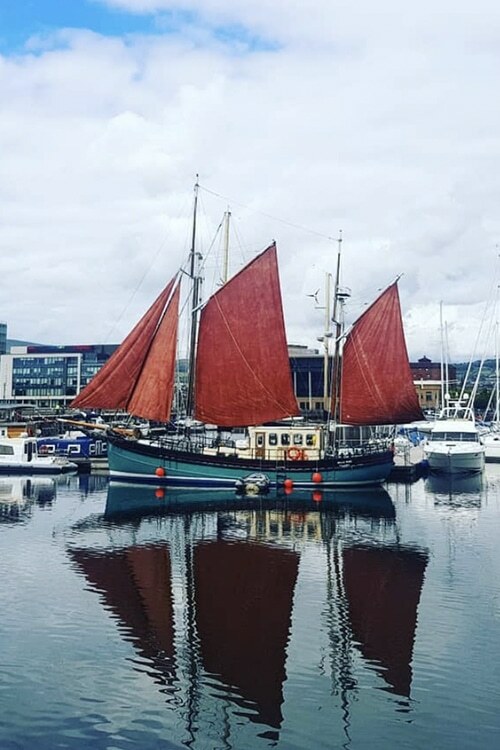 The beautiful Sailing Ship is the culmination of a 3 year renovation andconversion project under the management of her previous owner Tony Mcloughlin, a professional Master Shipwright. powerful marine diesel engine. The vessel is now a perfect example of Upcycling, Recycling, Re-use and Sustainability. Brian Ború is licensed to carry 12 passengers through the Irish Marine Survey Office (MSO). She carries a P3 and P6 (Com-sail) License. She is an extremely well built vessel out of Oak and Larch, very well built and very well maintained. All required safety features are kept up to date and survey regularly. power to ensure safe passage. Every day we learn from the sea and from each other. We want you to leave the ship feeling that you have been part of the crew and have had a unique and memorable experience with friendly and helpful people, passionate about their work. Sailing is all about sharing. Whether you prefer to be out on the deck enjoying the scenery and setting the sails or inside the spacious wheelhouse drinking a coffee with the crew you’ll have plenty of space to mingle. 12 berths are available to be filled by our passengers with a simple and functional communal toilet and shower. They are cosy but comfy, just like “in the rare old times”. Whether dolphins will accompany us on our journey, or majestic sunrises and rainbows will point our way rest assure your memories on the Brian Boru will stay with you for life. We believe in sustainable transport, that’s why we will only provide the best South American coffee that arrived to our cups strictly UNDER SAIL. Want to impress your guests? How about a party on the deck of a traditional sailing boat? We can host up to 40 people as we’re moored by the quayside. Team activities can be organised, live entertainment can be arranged, and food and refreshments catered for.